"The information in this report should provide a clarion call to Congress to require him to disclose his taxes and to establish prohibitions on Trump using his office to enrich himself." “Our current president has two jobs: leader of the free world and owner of hundreds of business entities worldwide. That combination is toxic for democracy,” Michael Tanglis, a senior researcher for Public Citizen’s Congress Watch division who coordinated the project, said in a statement. “Roughly half of the entities were related to projects in foreign countries, including Argentina, India, Saudi Arabia, and Indonesia,” the report notes. “The risk of self-dealing, conflicts, and corruption is just as great as if there were no separation at all,” Tanglis notes. 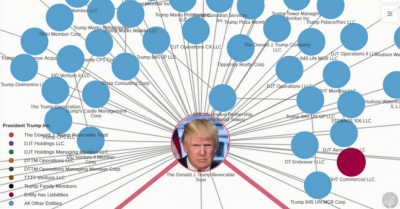 An interactive map and a downloadable dataset, both released alongside the new report, show the complexity of Trump’s business ties, revealing the vast number of potential conflicts of interest. As Common Dreams has reported, Trump is currently facing several lawsuits that allege he has used the office of the presidency to turn a profit. “For far too long, they have achieved an outsized influence on public policy by filling the coffers of elected officials who in turn craft policy to their benefit,” Tanglis concludes.